Big Brother 12 - Everyone Thinks Rachel Has A Power, lane: "It's not America's Player it's America's train wreck"
9:10pm Living room the entire house They are trying to figure out what the saboteur message was all about. They agree that America voted who will be the saboteur but they can’t seem to understand why anyone would pick to be it. They figure there must be a incentive greater then just cash. They are caught up on the saboteur saying they’ll “cruise to the half million.” Matt thinks the sab is stupid and he’s glad there back so he can start using his sab jokes again because “BB10 jokes are getting boring” Enzo: “who cares about the sab what are they going to do release some farting gas or something” Theres some wild theories going around, at one point brit says there not going to give the sab some amazing power it would be like handing them the 500K. Matt agrees he doesn’t think the sab is a huge deal. Talk stays on the incentive for awhile most people suggest something crazy like coup d’etat but Brit suggests that maybe it’s money 20K perhaps. Matt gets called into the DR. They even entertain the idea that a player may be coming back… The conversation starts to slow down and theres talk about tomorrows POV, They wonder if they can get out there tonight to practice like last week. 9:52pm Cabana room Lane, Hayden, ragan and Brit There trying to figure out who would take that deal. Lane: “I have the biggest headache”. Ragan: “OH my GAWD this is going to be so stressful” Brit thinks that it’s going to be Rachel or Brendon because America knows that they are screwed right now. HAyden: “Rachel and Brendon are loving this” Brit doesn’t think they have a power, ragan they could have the coup d’etat (man this guys will be up all night grinding away at this) Kathy joins them. Lane and Brit start talking about how Rachel was in a good mood after her DR session today. Brit:”She went into the DR worried about elimination when she came out she was happy”. Lane says that Brendon told them that matt got a lot of money not a dollar. Brit says she saw the dollar up in HOH she thinks DR told Rachel she has a power thats why she happy. Brit starts explaining what Brendon was explaining Greek mythology and how Pandora’s box works.. they laugh. Brit continues that Rachel is keeping Brendon in line which is usual. kathy: “It’s usually the other way around”. They speculate that maybe she’s trying to keep the drama down until she uses the power. Brit is convinced that Rachel is going to get some kind of help and they will both stay. hayden: “ohh don’t say that”. Lane and Brit tell them that Rachel’s been saying that if POV is used then she’s going to get Matt to put Kathy up and they have the votes to get her out. Kahty: “Oh great so she’s throwing me under the bus again” Brit continues, she says Rachel also thinks that if its a tie that she’ll use the 5grand and get matt to vote out Kathy. Ragan: “That will NEVER happen”. They start wondering if maybe Rachel is loved by America, Ragan is starting to think that maybe Rachel is the star of this season. Lane: “Oh my god”. Hayden: “Thats too bad because she doesn’t deserve it” ragan: “I don’t care about pranks and little jokes but if one of those two (b/r) don’t go home on Thursday i’m pulling my hair out” Lane gets called to the DR.. MAtt comes in. Matt I feel like i’ve been sabotaged here i had no idea that opening the box would cause that, I’m siting here thinking that you all suspect i’m the sab. They tell him there sure the sab was voted by America because America loves rachel. They go over all the strange behavior they’ve seen from Rachel today. Hayden says that maybe Rachel is hated by America but because every single week she’s the centre of all the action that they’ve voted her to stay. Ragan: “Absolute worse case scenario she has a power that will let her come off the block”. They go round and round about the sab.. reiterating everything 2 times over. They seem convince that it’s rachel.. Hayden says that if they offer the sab position to someone that is on the block and is going home the incentive can be small like 20grand but if they offered it to one of us that are in a decent position this week then the incentive has to be huge, “20 grand won’t cut it for me”. They start going over the POV contest.. thinking it’ll be skill based. Brit should shut the hell up ! Her mouth is gonna cost her 500k. She’s not catching on to anything, she’s to busy running her mouth. she so fake and needs to go. I love Britney but you are so right about it’s time to SHUT your MOUTH and start LISTENING. She should be so AWARE of the “BRIGADE”. She is friends with most of them. Britney has alot going for her. She is comical, very attractive, staying true to her engagement yet still enjoying the others males in the house as friends. Britney could win this game if she starts listening and stops TALKING. 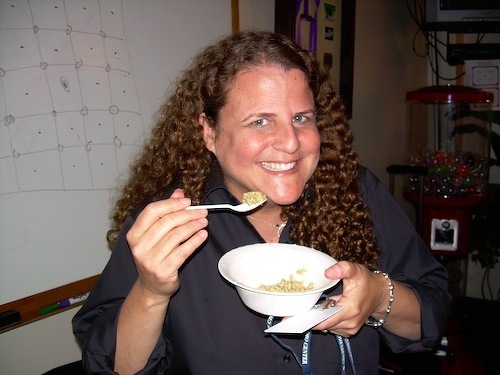 I’m confused about why Julie said it was the most powerful HOH this season. Can anyone tell me? All HOH’s before this week’s were without the Pandora’s Box gimmick. After rachel leaves Matt has to go next and take boring hayden with him! Brit’s playing a solid game, IMO. I confess she sucked at the beginning of the season but the more I watch the feeds & BBAD, she is hilarious! She is mad gaming and may be the one to beat. I’m pretty psyched that she hooked up with ol Lane in the Brigade. On another note……Good Lord, does Matty really have to treat the popsicle like that????? xo & grenades everywhere yo! Matt is sucking the life out of that popsicle! Missed the popcicle scene with Matt. Do you think that they will show it on Sunday night? Or it that obvious that he is trying to turn Ragan on? I agree with your statement about Brit. I didn’t like her very much at the beginning, but for the last couple of weeks shes the one HG that has consistantly made me laugh. I think some peeps aren’t reading her right. She may come from money, who knows, but she seems to me to be pretty down to earth and actually thinks about decisions and strategy, rather than succumbing to knee-jerk reactions or vendettas. Boy do we have dirty minds!!!!!!!!!!!!!!!!!! Is anyone watching this? Lane is smitten with Britney. It is actually quite adorable. Ragan is playing pretty cool for being the sabateur. He is the perfect choice. Ragan has been playing them all the entire season. He is a psychology professor. He knows more about the other houseguests than they know about themselves. He is manipulating a lot of them and is buying votes with his compassion and understanding. Just as Kathy is. she wont stop talking smack about people and telling EVERYONE EVERYTHING…she thinks rachel won america’s vote? shes freaking stupid, she thinks she picks up on things, watch the feeds, she does it ALL DAY LONG…shes right 1/250 times. Britney is the puppet of the game. tell the whole school. SHE NEEDS TO GO! its pathetic to see kathy get made fun of go back and then make fun of brenden and rachel for what they were saying about trying to win…and she shoots at them with her hand…. when they leave, who is your buddy? these people….then they want to “hang” him…I mean what are they going to talk about when he leaves? the stuff he did when he was there? like make them food? sigh…why are they so mean! its weird, there are 2 votes, wtf are they thinking, kathy should be trying to nab their votes for down the line, so should brit…they are so stupid…its like they think it ends when B nd R leave…its silly. This season is so stupid. Like people don’t know how to play the game. ones that are winning everything and focusing on the game. What i don’t like is that they trust everyone and tell everything to britney. Britney is the puppet of the game! Who is writing this website? The spelling and grammar are so horrible that it is very hard to understand what is being said. I think the writers are doing an awesome job and am very glad this site is online. me too. I can understand everything perfectly. It keeps me up to date when life gets in the way. haha simon and Dawg are doing an awesome job. They are typing as fast and summerizing as quickly as their little fingers can type. They take hours of conversation and try and make sense of it in a very short time as they still have to watch what else is going on. It is not easy whatsoever. EVERYONE writes their own statements and the guys running this site are the BEST! GO SIMON and DAWG!!! Brendon also cleans up behind everyone. That house is going to fall apart when he leaves –he’s the only one doing any cleaning. It’s almost compulsive with him. He’s a really nice guy who has been caught up in the spider web of Rachel’s narcicism and it is going to cost him. When she meets some wealthy guy in Vegas — it is all over for Brendon, poor guy. I hope and pray that Rachel goes next week and that the Brigade recruits Brendon and that he somehow winds up the winner of this season and he blows Rachel off. She sulks like a spoiled child. She is looking less and less attractive by the minute.